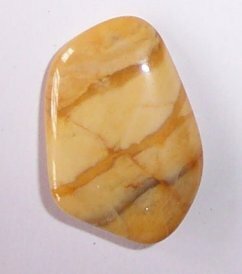 Jasper is an opaque variety of chalcedony. Yellow Jasper is an energising stone and helps you to feel stronger and in a better physical condition. It is particularly beneficial to the endocrine glands and the cleansing organs - especially the kidneys. All forms of jasper are used for protection against both physical and non-physical dangers. It promotes mental processes and helps to restrain impulsive desires or whims which could lead to dangerous situations. Jasper can help those with emotional problems including feelings of guilt, the loss of a loved one or fear of the future.